The Nokia N97 is an upcoming "mobile computer" by Nokia, announced on December 2, 2008. It will be Nokia's second touch screen phone based on the Nokia Series 60 platform. 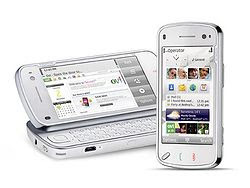 The N97 has a 3.5-inch, 640 x 360 pixel (16:9 aspect ratio) resistive touchscreen display (with tactile feedback) and QWERTY keyboard into this sliding communicator with an "always open" window to favorite internet or social networking sites. Price is unavailable at the moment as this product will be only expected in the market in the first half of 2009.
wow this is nice! buy this? marvic not join my giveaway ke? can join post bout the contest and add my link to your blog.